A few weeks ago, we attended a cocktail party at the Tasting Table kitchen where Maille, known for their fabulous Dijon mustard, introduced their limited-edition collection of gourmet vegetable-flavored mustards called Les Jardins Secrets des Chefs (French for The Chefs’ Secret Gardens). This trio of mustards is characterized by the herbal and vegetable influences of the season. The three featured mustards―Mustard with Carrot and a Hint of Shallot, Mustard with Olives and Herbes de Provence, and Mustard with White Wine, Beetroot, and a Hint of Honey―were each unique in terms of flavor and spice level. Guided by Pierette Huttner, the first mustard sommelier in the United States, we tried each one on their own, and you can really taste the distinctive herbs and vegetables in each one. All of the dishes that Tasting Table prepared that night featured these mustards or other Maille products and everything was incredibly flavorful. But out of all the dishes, I absolutely loved the Sunchoke and Potato Salad and the Beet and Burrata Salad with Honey Dijon Vinaigrette. I kept going back for more (and more). So instead of parking myself by the buffet table where these salads were, I requested the recipes for both and they happily sent them to me. So I am sharing them here with you. This is the potato salad you are going to want to eat all summer long! Sunchokes, also known as Jerusalem artichokes, are sweet and nutty when roasted and add such a delicious tone to this potato salad. While this recipe does not feature one of the three mustards above, it does have another excellent blend that you should definitely add to your dishes-the Sun Dried Tomato & Espelette Chili Pepper mustard. 1. Make the roasted sunchokes: Preheat the oven to 350º and line a baking sheet with aluminum foil. In a large bowl, toss the roasted sunchoke ingredients together and spread out on to the prepared baking sheet. Roast until the sunchokes are tender, 20 to 25 minutes. Remove from the oven and cool completely. Once cooled, slice into ¼ inch rings. 2. Make the fried shallots: In a medium saucepan, heat 2 inches of canola oil over medium heat to 325º and line a plate with paper towels. In a medium bowl, toss the shallots with the AP flour to coat. Working in batches, fry the shallots until golden brown, 2 to 3 minutes. Using a slotted spoon, transfer the shallots to the prepared plate to drain.Immediately season with salt. 3. Boil the potatoes and greens: Prepare an ice bath and set aside. In a medium pot, add the potatoes. Cover completely with cold water and season liberally with salt. Bring the water to a boil over high heat, then lower the temperature to a simmer and allow to cook until the potatoes are tender, 10 to 12 minutes. Remove the potatoes from the water with a slotted spoon and place in the prepared ice bath until the potatoes are fully cooled.Remove the potatoes from the ice bath and slice into ¼inch rings. 4. To the same pot, add the mustard greens and cook until vibrant green and tender, 2 to 3 minutes. Transfer the greens to the ice bath and let cool completely, then ring out with paper towels until dry. Place the greens on a cutting board and roughly chop. 5. Make the dressing: In a medium bowl, whisk together all of the dressing ingredients. Add the reserved sunchokes, potatoes and greens and toss until the vegetables are coated well. 6. Transfer the salad to a platter and garnish with fried shallots, then serve. This incredible salad with candied sunflower seeds, roasted beets and creamy burrata is a keeper! 1. Make the roasted beets: Preheat the oven to 350º. In an 8 inch square baking dish combine all the beet ingredients and toss to coat. Cover with tin foil and roast the beets until tender when pierced with a knife, 45 minutes to 1 hour. Allow the beets to cool completely, then peel, and cut each into 8 pieces. 2. Meanwhile, make the candied sunflower seeds: In a small bowl, toss the candied sunflower seed ingredients until well incorporated. Spread into an even layer on a parchment lined baking sheet. Roast sunflower seeds in the same oven as the beets until golden brown, 8 to 10 minutes. Remove from the heat and allow to cool on the baking sheet. Using your hands, break apart any clumps of sunflower seeds, then set aside. 3. Make the vinaigrette: In a medium bowl, whisk together the lemon juice, Maille Beet Mustard with a Touch of Honey, honey, lemon zest and garlic clove until smooth. Slowly start to pour in the olive oil, whisking constantly, until all the oil is emulsified and a vinaigrette is formed. Season with salt and pepper. 4. Assemble the salad: In a medium bowl, toss the roasted beets with half of the vinaigrette. Transfer to a platter and top with pieces of the torn burrata. In the same bowl as the beets, dress the mache with the remaining vinaigrette. Pile the mache over the beets and burrata. Garnish with the reserved candied sunflower seeds, pomegranate seeds and sliced golden beet. In a small bowl, whisk together the honey dijon with the olive oil and drizzle on top of the salad, then serve. As you know, I am a huge fan of Maille products, so it was fun to learn about all these blends and to taste dishes actually created with them. Of course, with the opening of Maille’s Manhattan boutiques, Maille’s signature “mustard on tap” is now available here in the US. They are served from authentic French ceramic pumps into cute earthenware pots which are then corked. They are reusable and refillable and also make excellent gifts! Plus, each store has their special blends and seasonal collections available. It’s almost like visiting their stores in Paris! 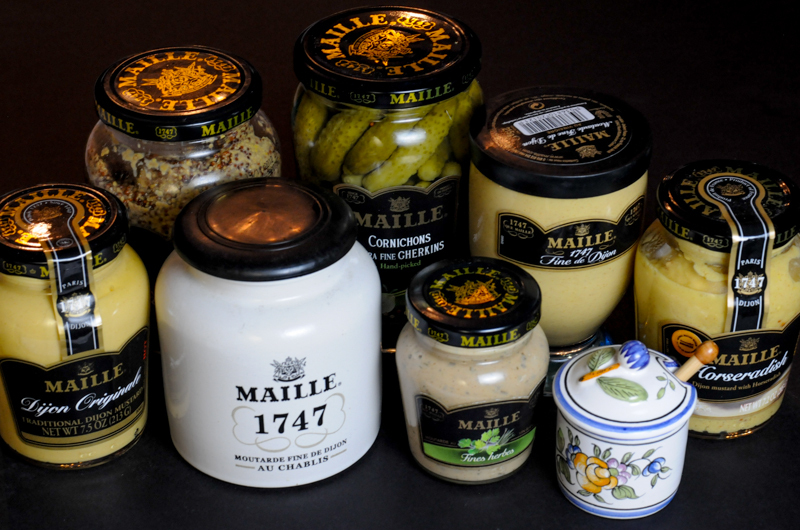 I also just found out that you can even attend a “Create Your Own Mustard” class at Maille’s new flagship boutique in the Flatiron district, as well as at Maille’s Lincoln Square location on Manhattan’s Upper West Side. I think I will be signing up for that soon! 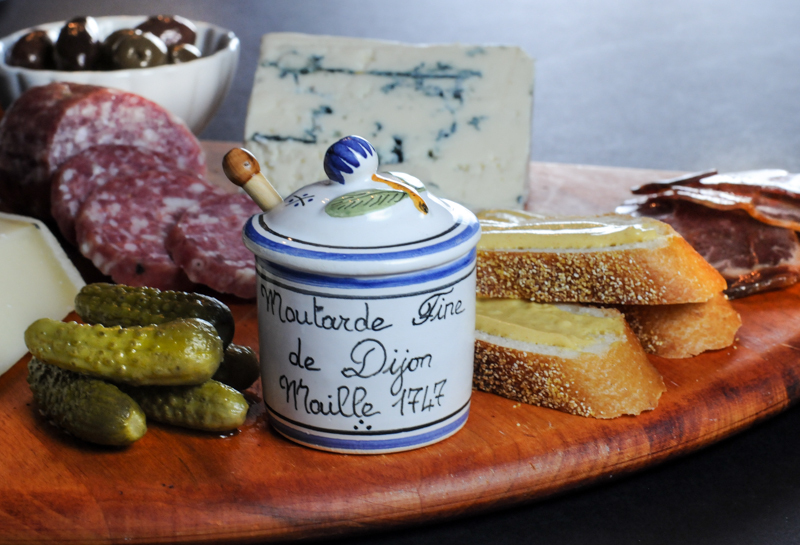 Disclosure: I received a collection of mustards as a parting gift and some were sent to me to make these recipes and while I was under no obligation to post, I did so anyways because I just love Maille products and wanted to share them with you.